There are two types of popular macaroons. One is a macaroon which is baked like a cookie size small cake consisting of ground almonds. The macaron (French version) is a sweet confectionery made with egg whites, sugar, almond powder, and food coloring. These macarons are filled with buttercream or jam filling. In the US, we know coconut macaroons which are usually dense and topped off with shaved coconut. But, I prefer them dipped in chocolate or maybe it's because I just like chocolate. I'm not a big coconut fan, but I do prefer the macaron variety. They are multi-flavored and more of a confectionery vs a cookie, I love the ganache filled ones. Which ever one you prefer, today is the day to best enjoy them. Happy Macaroon Day! Follow the #foodcalendar on Twitter for more food holidays. On this day, we take time to salute those who have served our country. For me, Memorial Day is a regular work day, people have to eat, right? But I did take time away from work to pay my respects to those who fought for our freedom. Go For Broke Monument Honoring the WWII Heroics of the Japanese American soldiers Commemorating the 100th Infantry Battalion, 442 Regimental Combat Team, Military Intelligence Service, 522nd Field Artillery Battalion, 232nd Combat Engineering Company, and the 1399th Engineering Construction Battalion. This 60' Moreton Bay Fig Tree (ficus macrophyllia) was designated as Los Angeles Historic Cultural Monument #920 I didn't know trees were given cultural monument designations, did you? Today is National Brisket Day! It's kind of ironic that this year it's at the end of National Vegetarian Week. If you didn't know there was a Brisket Day or Vegetarian Week, now you do. Brisket is one of those tough cuts of beef. If cooked wrong, can be a tough piece of leather. On the other hand, if cooked right it can be tender, juicy, and flavorful. Brisket is from the lower chest area between the forelegs. This muscle of the steer gets a lot of work and isn't much fat marbling. 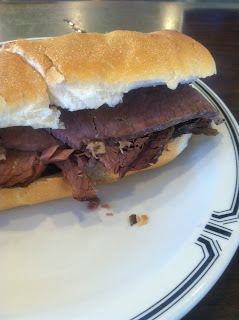 Much of the brisket used today is made into corned beef, pastrami, or pot roast. Spending summers in Hawaii with my grandparents, aunties, uncles, and cousins will be a memory that I'll always remember. Besides family, I have fond memories walking down Kapahulu Avenue to the beach, Zippy's Surf Pac, fishing, picking guava, malasadas from Leonard's, mango picking , shave ice after a day at the beach, oxtail soup at Kam Bow, plate lunch at Rainbow, Checkers and Pogo, and Ala Moana Center. I was saddened to hear that one of my childhood favorites will be closing on Saturday, May 28th. 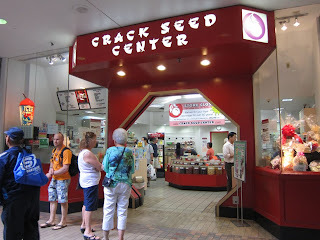 The Crack Seed Center was one of the original tenants and fixture at Ala Moana for 52 years. It's also one of the places that I used as a landmark on the lower level mauka side of the mall. I'll be lost without them in more ways than just as a customer. Let me explain...This Sunday is the annual running of the Indianapolis 500. It's my Memorial Day Weekend tradition to watch the race and I'm a fan of open wheel racing (Indy and Formula One). Friday is known as "Carb Day", meaning the cars that qualified for the starting field are given the opportunity to practice in their "Race Day" set-up. "Carburetion Day" is the final tune-up before Sunday's race. The funny thing about "Carb Day" is that Indy cars haven't used carburetors in about 50 years, they all use fuel injection systems. 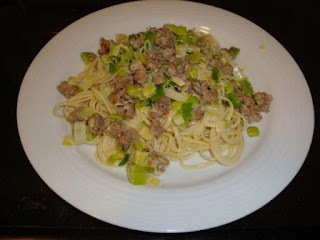 Since Friday is Carb Day and the goal at the Indianapolis Motor Speedway is all about speed, here's a FAST and easy pasta recipe, one of my nieces' favorites too. Since I don't travel as much as I used to, I'm not able to visit these places often. I did, however, stumble on a place that serves a great pepperoni pizza, Pitfire Artisan Pizza. The secret to their pepperoni pizza? Zoe's Natural Pepperoni, which is made without BHA, BHT, or nitrates. Thus resulting in a flavorful cured pepperoni and the best that I've had. Fortunately, Zoe's Meats does sell their meats online (www.zoesmeats.com). Just got off the phone with a telemarketer, he was offering me a special discount on a trade magazine subscription. But I subscribe to the competition AND at a lower rate. Having worked in sales and a marketing background, I'm always interested how sales people handle objections. I mentioned to him that I subscribe to the competition and the deal that I have from this other publication is $30 less than what he was offering. When I gave him the price objection, I do give him credit for explaining the Value of the $99 package and mentioning it included online access. What he couldn't overcome is that I pay $30 less for the same trade information, he did start by saying that last week the package was $199, which I know to be true. He was pretty truthful with me, but NEVER talk bad about the competition to a customer, which he did. I was fortunate to grow up near Downtown LA. One of my fondest memories was being able to go to all of the old time food places in the area, one of the most famous is Original Tommy's on Beverly and Rampart. My dad would take us to the original location and we got to eat sitting in a parking lot. Who knew that eating on the sidewalk or in a parking lot would be considered 'trendy' back then as it is today with all of the gourmet food trucks. Tommy's was one of the places where everyone headed to after a game or concert, people in line would be talking about the game or concert. But today, Original Tommy's is celebrating their 65th Anniversary. Besides food service consulting, I work with corporations on marketing, product development, packaging, promotions, PR, and lately social media. I'm finding out that a lot of companies don't participate in the community that they conduct business in. How do they expect to be part of the community? The ones that I do talk to, think it has to do with having a booth at the local festival. Yes, that could be one way, but it could be as simple as using their parking lot on a Saturday to wash cars to raise money for new team uniforms or passing out advertisements for community sponsored event. I got lazy and have my favorites posted here. Have a good trip...Aloha! Zippy’s – My #1 Favorite Place growing up and still is. Closed Mondays – otherwise open 24 hours. Kalua Pig (traditional imu) One of the best I’ve had – retail. Saimin, won ton mein, teri beef sticks.